and the longest in the Southern. and joy in whatever tradition you follow. May the holiday season bring you everything you need. 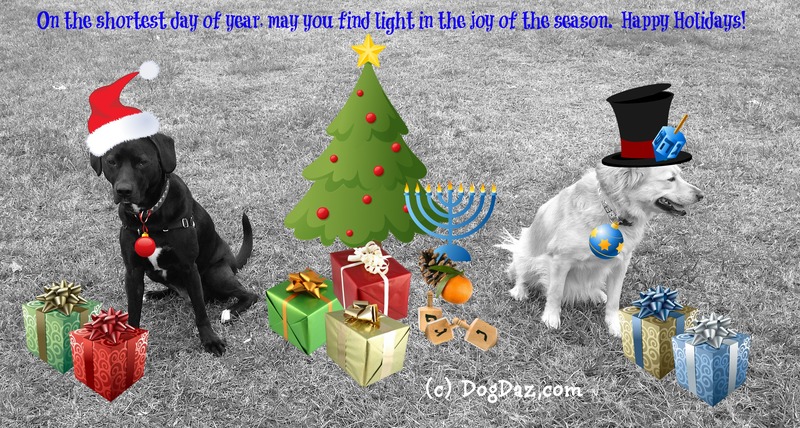 Seasons Greeting from DogDaz Zoo. We are taking a short break and will return in early 2018. Don’t go too far. The cats are always amazed by the lights of the Christmas tree (which you can see reflected in the window behind Noel and Stella). K8 caught them watching the twinkling from a safe distance. Nine, of course, was already climbing the tree, doing his best to undo all the wonderful decorations that K8 and V were putting up. Don’t forget to celebrate the shortest day and longest night of the year (Winter Solstice) today in the Northern Hemisphere. We gain a bit more daylight every day now until the Spring Equinox. Bones – Small turkey and ham bones can lodge in the throat, stomach and digestive tract requiring surgery to remove. Also, the fats and gravies that you may add to your pets‘ food can cause diarrhea and vomiting (and ultimately pancreatitis (Yuk!)). 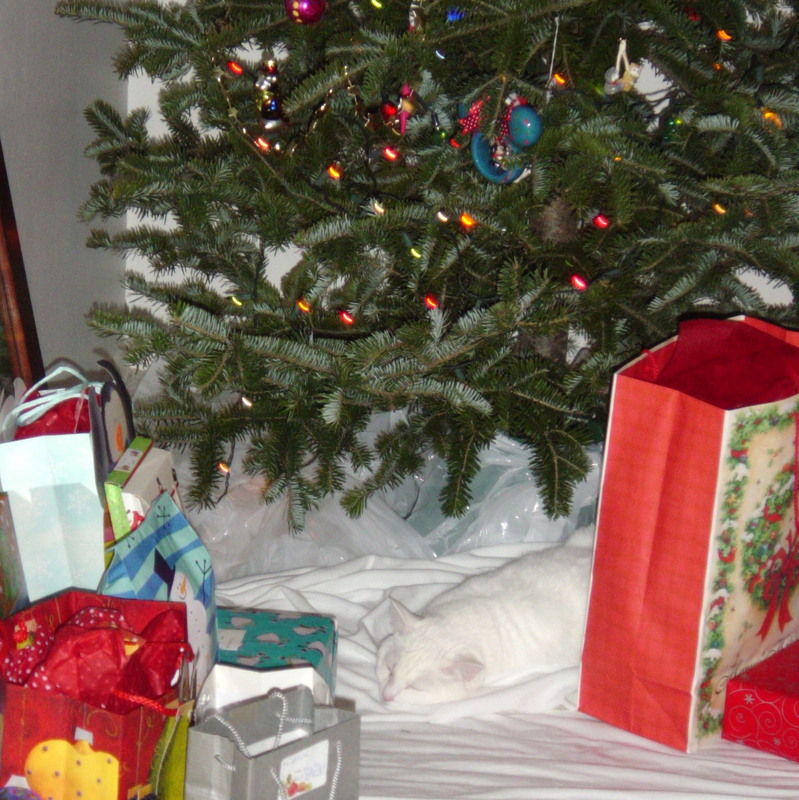 Christmas Trees – These create a whole realm of dangers for your pet. Poorly secured trees can fall on rambunctious pets as the run around or try to climb them. Pine needles can cause GI irritation and perforation. Sharp or breakable ornaments should be kept well out-of-the-way of curious mouths and paws. Christmas trees may contain additives and preservatives, which leech into the water and can be toxic if ingested. Tinsel, yarn and ribbon can cause linear foreign bodies (get wrapped up throughout the intestinal tract) and create a blockage and/or possible perforations. Electrical Cords – These are always a hazard to curious kittens and puppies. But the extra lights and decorations give even more temptation. Make sure that all electrical cords are in good condition and out of reach. 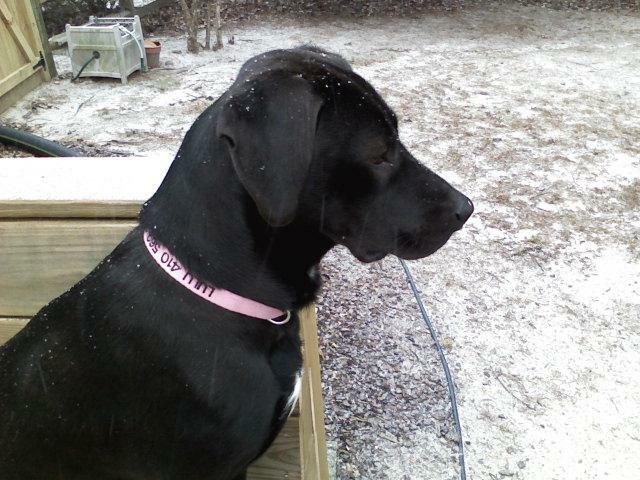 Holiday Plants – Many plants can be poisonous to you pet. The holidays add a few more to that list and include mistletoe, poinsettia, lilies and holly (the berries are especially toxic). 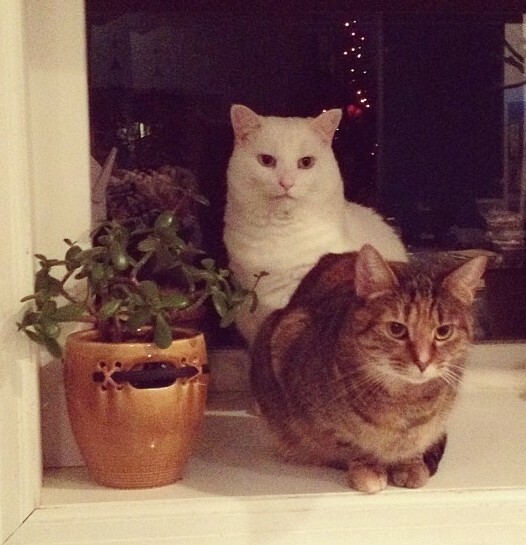 Lost Pets – The holidays make it easier for pets to sneak their way out of the house with the extra guests and visiting friends going in and out. Be sure to keep identification on your pets and keep them contained in a bedroom if you are expecting a lot of foot traffic through your front door. Sweets – Holiday candy can cause GI problems and become toxic once ingested. Chocolate is one of the most common causes of toxic reaction in pets. The darker the chocolate the worse it is. Do not place wrapped boxes of chocolate under the tree – dogs can sniff them out. Also be sure to keep the candy dishes covered so playful paws aren’t tempted to fish them out. Let’s all have a safe holiday season! Mom said that many humans think that today marks the end of the world. Actually, she wishes that today would mark the end of the violent world as we know it and the beginning of a new peaceful one with no more killing of innocents or war or any hate stuff. But alas, we have been told that our Mom is a big dreamer. For us, today is the first day of winter, and hopefully that means that white stuff will start falling from the sky soon. We love white stuff. It is fun to eat and romp in. We really do hope the sky falls soon. Mom’s family came from Northern Europe and there they celebrated a festival at midwinter called Yule. We like festivals. From today on in the Northern Hemisphere the days will start to get lighter and that is really welcome. From A to Z, it seems like most cultures needed festivals at this time of year to help them survive the winter. Mom started to tell us all their names and became overwhelmed: Beiwi, Brumalia, Chawmas, Christmas (we know that one), Maidyarem, Dongzhi, Goru, Hanukkah (we know that one too), Hogmanay, Inti Raymi, Junkanoo, Karachum, Koleda, Wren Day, Lenaia, Lohri, St Lucy’s Day….. So we decided we are going to celebrate everyday because somewhere, someone is, so we will too! Happy Solstice everyone and may the sky fall on your head and you catch it on your tongue and taste it’s sweetness – SNOW BALL FIGHT!!!!! Throw the snow ball at someone and let us know who in the comments so we can throw one at them too!